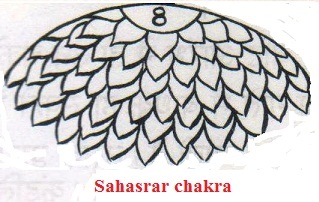 Sahastrar or the Crown or Supreme Chakra : Sahastrar is the supreme power or 7th chakra of our body. It is the most important thousand patelled lotus situated at the top of the brain. Above all these we have Sahasrara Chakra which is the chief of all the Chakras. All the Chakras have a intimate connection with this centre. Hence this is not included as one among the Shat-Chakras. This is situated above all the Chakras. The ultimate aim of any type of yoga viz hatha yoga, bhakti yoga, mantra yoga etc. is to awaken kundalini power. The awakening of the kundalini is complete only when the kundalini meets the crown chakra. It is the known as the hole of Brahmand. Lord Shiva is seated as the supreme awareness, the super consciousness or transcendental body at the crown of the head inside the Sahastrara. In the vedas as well as in the Tantras, this supreme seat is caaled Hiranyagarbha, the womb of consciousness. It corresponds to the pituitary master gland situated within the brain. In our body or Kundalini , the supreme consciousness represents the highest possible manifestation of physical matter in the body. This psychic, supersensory or transcendental power in man is the ultimate point of human evolution. When the kundalini shakti meets the crown chakra, it leads to the beginning of a great experience. With this union, the moment of self-realization or enlightenment begins. Every religious system of the world has its own way of describing this experience. Some calls it nirvana, others samadhi, self-realization, enlightenment etc. The Crown Chakra or sahasrara is the ultimate of a Yogi. When kundalini is united with sahasrara, the yogic aspirant enjoys supreme bliss.When Kundalini is taken to this centre, the Yogi attains the superconscious state and the Highest Knowledge. Sahastrar is the seat of cosmic awareness and is the terminal point of the Kundalini Shakti.From the Sahastrar our life force is released or supplied to the body whenever it is required urgently in case of emergency. This entry was posted in Smart astro guru, Yoga & Kundalini Shakti and tagged Crown chakra, Sahastra in the body, Sahastrara, Supreme chakra by R. N. Sharma. Bookmark the permalink.